Doesn't Mr. Jack-O-Lantern look spooktacular & happy? I love, love, love October! Ghoul and gravestones pop up in suburban yards. Scarecrows and carved pumpkins grin at you from pretty porches. There might even be witches on broomsticks and skeletons lurking by the mailbox. The playful whimsy of the month is infectious. And nowhere do I get more inspired than in the kitchen. In the past, I have served Monster Meatballs (with olive eyes and carrot hair), black pasta (made with squid ink), Graveyard Cake (some call it dirt cake)...in other words, yes, I like playing with food. 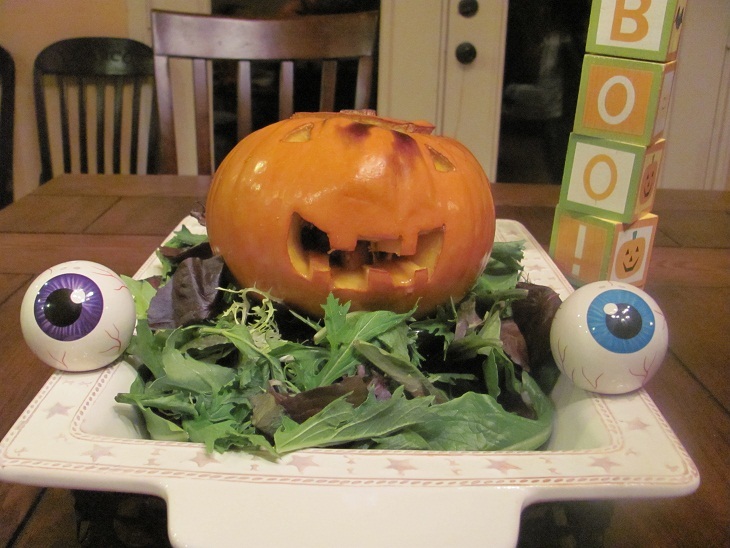 :) So I loved it when my #Letslunch twitter buds, a group of food bloggers from around the globe, chose this month's theme: SCARY! I like to involve my entire family in my kitchen projects...fun and educational for the kids, less work for mom and dad doesn't feel left out. Yeah, I delegate. And, seriously, the kids loved putting together Mr. Pumpkin. First Step: Go to the store and find the "perfect" pumpkin. For our family of four, we used a small pie pumpkin. I decided it had to be between 3 to 4 pounds. Rest I left up to the kids. They found a good one with a little bulge on the front...perfect for a nose. Second Step: Prepare the pumpkin. The DH was put in charge sharp tools and, together with the kids, he carved out the lid, scraped and cleaned out the pumpkin (yes, the kids saved the seeds for roasting) and created a jovial Jack-O-Lantern. Yay! Third Step: This is where I come in and prepare the filling. I think I love working in the kitchen during Fall because of all the great seasonal ingredients: vibrant pumpkins, crisp, tart apples, ruby-red cranberries and sweet, warm cinnamon. Mmmm. So for the filling I put together a curried turkey-couscous mixture with sage, apples,cranberries, chickpeas, tomatoes and a dash of cinnamon. I always make extra because the family loves this as much as I do. Fourth Step: Season the pumpkin. I brush melted butter on the insides of the pumpkin and then seasoned with a bit of salt and pepper. Next time, I'd add a bit of powdered garlic. Then I spooned in the filling. Step Five: Replace the pumpkin lid, place the entire pumpkin in an oven-proof dish and cover with foil. Place the dish inside the pre-heated oven. Bake at 350 degrees for 30 minutes. Remove foil and bake another 10 to 15 minutes, or until pumpkin is done. Step Six: Prepare for serving. Take all the pictures you want (Mr. Pumpkin was a star...he had 3 photographers snapping pictures from every angle imaginable...I stayed out of the fray) and then cut him into wedges. Heat oil in a frying pan. Add onions, celery, red pepper flakes and sage leaves. When the onion is half-soft, add in garlic, apples, and curry powder. Cook for for a minute or two. Add in ground turkey. Cook while breaking up the pieces, until turkey is browned. Stir in couscous, chickpeas, tomatoes, cranberries and garam masala. 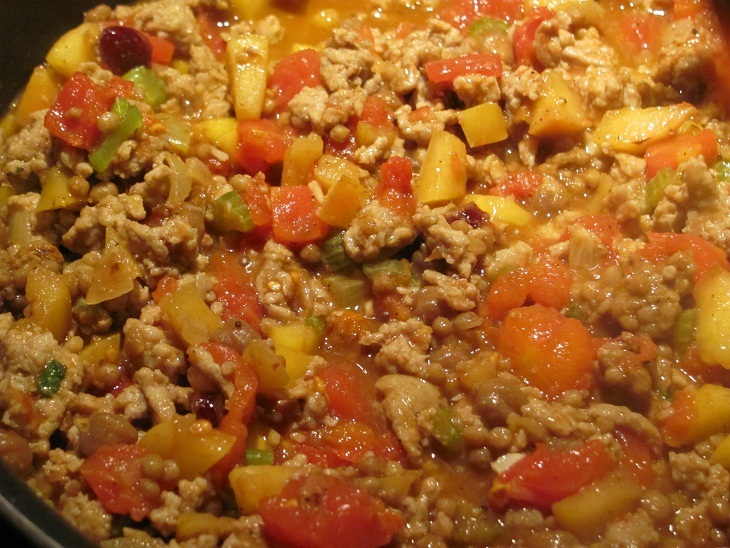 Cook until ingredients are warmed through and the sauce thickens. Take off heat. 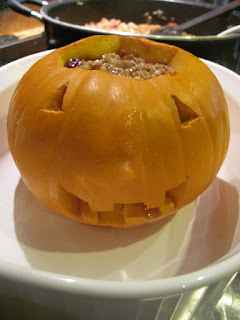 Use what you will for the stuffed pumpkin. I love serving the leftovers over baked sweet potatoes or in scrambled eggs. 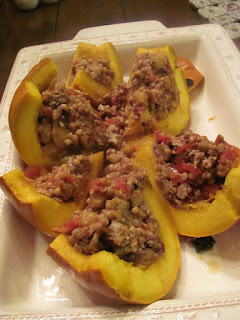 I do love stuffed squash! That makes me excited for the fall. Wow! What a beautiful pumpkin! I should have NEVER read this just before dinner - I can almost smell it. This looks delish! That looks sooo good!! Without the eyes/mouth, it could work for Thanksgiving too! And just hypothetically, for a vegetarian, extra beans or veggie crumbles? Umm... can I borrow your kitchen in a couple weeks? Ooh, you could do black beans & veggie crumbles!